Tyrod Taylor set a franchise record against the Texans on Sunday. 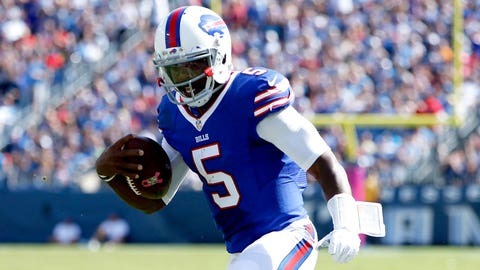 When Tyrod Taylor was named the starting quarterback for the Buffalo Bills this season, there were questions about his ability to prevent crucial turnovers. Entering Week 13, Taylor had thrown just four interceptions and lost one fumble, proving he can certainly take care of the football and make big plays in the process. But Sunday against the Houston Texans, Taylor took the next step by setting a Bills record for consecutive pass attempts without an interception (176), a mark that was set by Drew Bledsoe (175) in 2002. Little doubt remains that Rex Ryan made the right decision naming Taylor the starting quarterback in training camp.